The following sermon was preached by Revd Dr Thomas Winger in the seminary’s Martin Luther chapel on 24 February 2014, the Festival of St Matthias, Apostle. Chosen to replace a traitor, lucky to choose the short straw, then to disappear from the face of the New Testament without further mention—it hardly seems that Matthias deserves a mention in the liturgical calendar, let alone the Bible. But as our Lord’s most interesting parables often have two fascinating characters—the Prodigal Son and his older brother, Lazarus and the rich man—so we find the meaning of Matthias as we set him alongside his predecessor, Judas. Now, the New Testament shows no interest in rehabilitating Judas. The perspective supposedly adopted by the apocryphal Gospel of Judas, that he conspired with Jesus to betray Him (not against Him), that Judas was therefore a good guy after all, is certainly not the viewpoint of St Luke’s account. Instead we’re told that Judas bought a field with the “reward for his wickedness” (1:18). And that as a just reward for his disgraceful deed he didn’t live to enjoy it, but hanged himself and spilt his guts upon this “Field of Blood”. Poetic justice. Certainly God used Judas in his plan to sacrifice His only-begotten Son for this sinful world; certainly God’s holy Word prophesied that such a betrayer would raise his hand against the Anointed. But I suppose that if Judas had repented of this filthy deed, the Lord’s plan would not have failed. Another betrayer would have fallen to hand. But the fact remains that Jesus, knowing the wicked deed that Judas had in his heart to commit, nevertheless chose him to be one of the twelve apostles, sent him out on a preaching mission, taught him and loved him day by day, even invited him to that most intimate Last Supper. So the most puzzling question is not how Judas could have betrayed his Lord, but how that Lord could have chosen a traitor as His apostle. Yet the Lord’s ways are not our ways. We choose the man to fit the job. We look for qualities and talents, commitment and vision. Very few of the apostles would have made it onto the faculty of Concordia Seminary. (We might have found room for St Paul.) Yet our Lord chose Judas. He chose him because there was an office to be filled, and it mattered little who would fill it. The office was the Lord’s, and the Lord’s to do with as He wished. It was never Judas’s. And when Judas betrayed both his Lord and his office, the office remained where he left it. 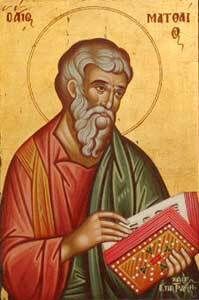 The prophecy that came to Peter’s mind that day was that a dwelling place would be left desolate and that another would receive the office. The call process by which that office came to be filled would scandalise any democratically-minded Protestant today. A crowd of 120 pushed forward two men and a new apostle was chosen by lot. Some higher critics have ridiculed this event, suggesting that the crowd was running ahead of God, who intended St Paul to be the replacement for Judas. But they’ve misread the text. For God was always running the show. Firstly, it was Christ Himself who established what it meant to be an apostle. St Peter put it into words: “So one of the men [ἀνδρῶν, no women apostles] who have accompanied us during all the time that the Lord Jesus went in and out among us, beginning from the baptism of John until the day when He was taken up from us—one of these men must become with us a witness of His resurrection” (1:21-22). The Lord had already made these men competent for the office by taking them into His care, leading and teaching them for three years, and then choosing to appear to them after His resurrection. You see, Peter has nothing to say about eloquence or nobility or multimedia skills. The Lord’s apostles don’t fit into such categories of competence. Their duties are simple: to give public testimony to what they’d seen and heard, and to leave the rest to God. So by prayer and drawing lots in the age-old biblical tradition, the choice was left in His hands. And then we hear nothing more. No more Matthias. It didn’t really matter what Matthias had to offer or would go on to do. The Lord once more had His twelve. The new Israel was reconstituted. God had filled the vacant place. CLTS Debt Eliminated! Thanks Be to God!